Michael’s work includes both public and studio art and is seen throughout the United States. Both reflect his interest in the environment and his desire to explore society’s common denominators. His art becomes a dialog as he investigates the back stories that make his art grounded to the site. 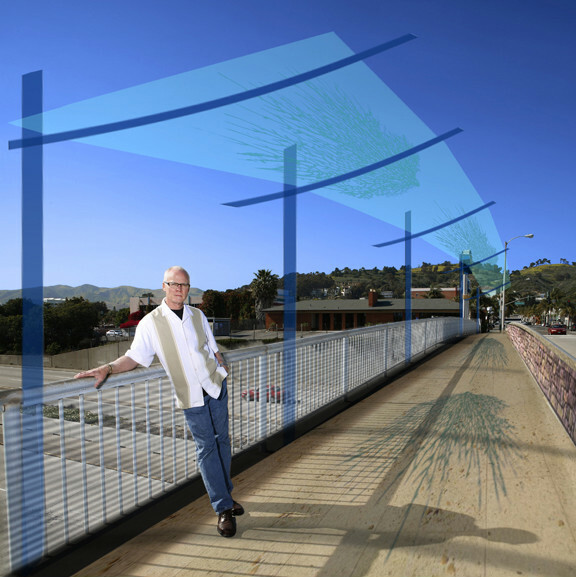 He has been selected to design artwork for the California Street/Highway 101 overpass in the City of Ventura, a project that will link the beach and the city and, it is hoped, help to mitigate the psychological breach created by the freeway dividing the city. In this portrait, Donna Granata laid one of the artist’s concepts over the bridge. With every public art project, designs change even up to the point of fabrication. This image documents the early design phase of this monumental project. Michael Davis’ documentation took place in 2008 and was sponsored by Cherie and John Brant. The FOTM Archive contains extensive information about this artist.